A New Design Studio Page Is In The Works that concentrates more on the new Cello System. As Apple computer has long demonstrated, a device can encapsulate high levels of sophistication and operational versatility - all in a form factor that graces The Museum of Modern Art, while still remaining exceptionally easy to use in more personal spaces. You won't find it as a flickering light show at Best Buy. It's for those with a discriminating ear ... and a sophisticated eye. In a related aside, the DermaWave power circuitry uses the same design essence of the Linn, above ... a 'switch-mode' power supply that rectifies the incoming AC wall current, then modulates it to a very high frequency - much like a 'Class D' audio amplifier (odd, though it may seem) - before rectifying and filtering it yet again. This, among other things, sidesteps the need for bulky transformers and reservoir capacitors ... along with their associated troubles (while also allowing us to create very slim-line designs). This, a far cry from the 'wall-wart' transformers used by others - available at any Radio Shack for a mere $15. Apple computer has also done much to re-educate the consumer masses - even with its click 'n spin wheel on its iPod music players. At last, consumers are just beginning to "get it". In contrast, the spa equipment sales industry becomes absolutely giddy over the inclusion of liquid crystal display screens - in areas where none are required ... GentleWaves 'Select' model, as a singular example, offered screen prompts that usher the following: 1) Remove Makeup, 2) Position LED array, 3) Begin Treatment ... No, we're not making this up. And the kicker is that this display, found in the 'Select model', ran an additional $4000, relative to the screenless 'Elite' model - even though the two machines had identical output specifications. That is (again), $4000 extra for the fundamentally useless display found on any $20 Casio watch. For that money (difference), you could buy our entire Planar Pro machine - with money left over. And it's not our intent to single-out GentleWaves, by the way. This silliness abounds throughout the Spa equipment industry. Then there are the large, pedestal types, on casters. Only upon unpacking the massive box does one realize that 85% of the device is dedicated to plastic drawers intended for towel storage. Wow. In all of our years engineeriing all sorts of devices, that idea escaped our cognitive design acumen. We bad. ... umm, not so much. We knew that we wished to present a product with an "understated elegance". For the very best of industrial design -- the devices that consistently win the design awards -- all have one thing in common: Restraint. A visual design savvy that combines clean lines and layout while remaining operationally unobtrusive for the end-user. With markups presumably determined by the square inch, many will endeavor to win you over with massive cases ... encasing 91% air, by volume. The shame of it is that they don't even do that well. And units from the old YouthLight, to the DermaVista Cold Light, to the Inner Act LiteLift (et, al) are famed for ushering in creations that look entirely akin to the Hallicrafter ham radios of the 1950s. To look at them, you'd think they ran off of vacuum tubes. This genre should, naturally, in no way be confused with the likes of Revitalight or Silhouet-Tone equipment, seemingly designed by Mr. Coffee, vying for space somewhere above the microwave. On every other Photo Rejuvenation device you may be looking at, the heads are simply the final link in the chain, responding to whatever fixed or limited parameters the machine offers at its output jacks. And as manufacturers raced to offer other heads -- operating at other wavelengths -- these heads would be bound by the original machine parameters. As such, simply adding a 'Blue Head' would result in it being modulated in exactly the same way as the 'Red Heads' originally supplied with the machine (reducing its efficiency, generally by one-half). In the ideal, however, it would be great if one could design a separate device -- with its own unique and dedicated parameters -- each time the wavelength (or "color") was changed. With our 'forward thinking' -- knowing that the future would likely hold new information with on-going research -- all DermaWave machines were designed to "auto-adapt" with an open-architecture design that would not only offer additional heads in the future, but would -- in turn -- create a new machine for any new head attached ... Said another way, we didn't make the mistake of backing ourselves into an engineering corner with fixed parameters. 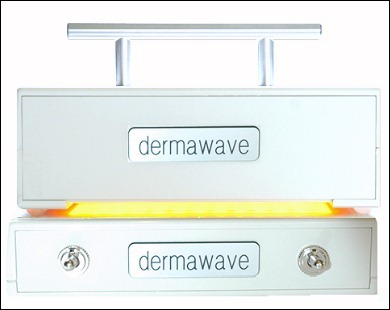 While the DermaWave heads are seemingly connected to conventional outputs as a final link in a chain -- as in all other machines, they're actually connected in a feedback loop to the main console. By each head type, of any wavelength, having its own dedicated and specific electronic parameters, a new machine is created -- one that is now optimized for each head. This, by way of our forward thinking ... rather than producing additional heads as an 'after-thought', tethered to an old inception. Oh, and by the way ... we can keep on going in this fashion -- "re-designing" the DermaWave you currently own by simply snapping on the new heads of the future, as the independent research warrants (we don't produce additional heads, simply for the hell of it). Buy a new head ... get a new machine (without buying another) -- one that has been newly optimized -- not simply added to a static design. And yes, it's a DermaWave design exclusive. The other internal circuitry that orchestrates all of the events for you is also fully protected. In fact, you could short the outputs with a screwdriver -- indefinitely -- and the circuitry would simply shut itself down, instantaneously. Release the screwdriver and the DermaWave will resume operation as if nothing had ever happened. Yes, it's true that you may have no particular plans to short the outputs with a household tool. But sometimes people can pinch and short an output cord to the heads -- the same effect as shorting the device with a screwdriver. While this condition will completely blow the circuit in all other machines, the DermaWave laughs ... and moves on. And it will do so at any input volatge found on earth - automatically. The internal power supply is also voltage regulated, picking up the slack of most any wall power slumps, inclusive of California-style 'brown-out' conditions. 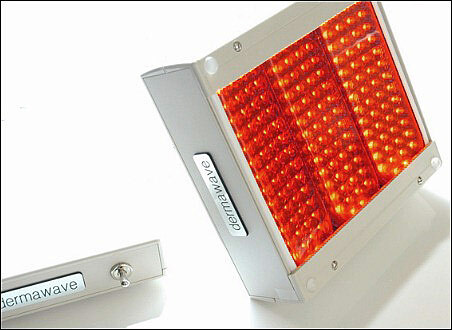 And all of the other things in a DermaWave, inclusive of 'Smart Ports' and photo-optical sensing? Even with a war-chest of patent filings, we're not here to assist others in their machine-making, distribution endeavors. Let their salespeople figure it out - the ones who couldn't twist two wires together, if their own lives depended on it ... unless there was a commission involved. Oh, yeah ... Free Shipping, too.